In addition to the medium pressure mercury lamp, Vapourtec also offer a selection of 13 specific LEDs ranging from 365 nm to 525 nm. These provide a precise wavelength and therefore do not need to be used with a filter. N.B. Vapourtec also offer a cool white LED providing a broad spectrum of wavelengths and a peak in the blue region. Please contact us for further information. Each of the LEDs provided are interchangeable and fit into the same reactor body. They can be easily changed by hand in less than a minute – providing versatility as your research needs change. LEDs are extremely efficient with a life expectancy of approximately 10,000 hours. Their low heat load means they can be cooled to temperatures as low as -40°C, in addition to the ability to heat to 80°C. 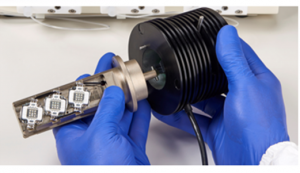 For photocatalytic applications, LEDs are the ideal choice of light source. 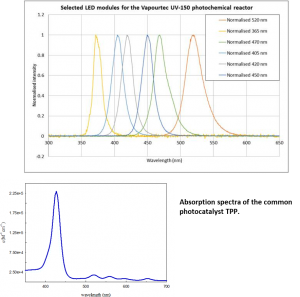 The ability to choose an LED with a dominant wavelength closely matched to the absorption characteristics of your photocatalyst is a huge benefit and offers the advantages of maximising reaction throughput whilst minimising unwanted side reactions. Juan A. Vega et al. “Continuous Flow α-Arylation of N,N-Dialkylhydrazones under Visible-Light Photoredox Catalysis.” Org. Lett., 2017, 19 (4), pp 938–941. Fabio Lima et al. “Visible light activation of Boronic Esters enables efficient photoredox C(sp2)–C(sp3) cross-couplings in flow” Angew. Chem. Int. Ed. 2016, 55, 14085. Emily Corcoran et al. “Aryl amination using ligand-free Ni(II) salts and photoredox catalysis”. Science., 2016, 353 (6296), p279-283.